The Book of Thumos (#ThumosBook) is the collection of books, each of which contributes to the development, the improvement, and the promotion of thumospathism. 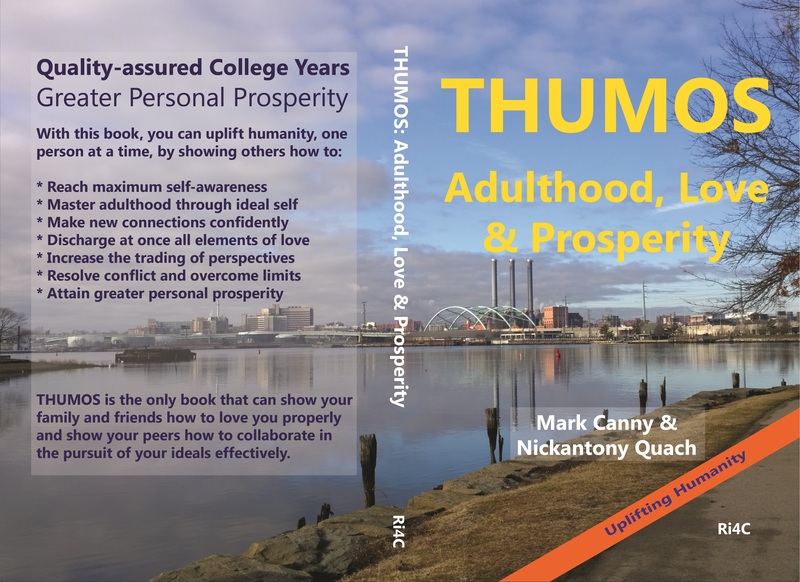 Its basic principles are spelled out in the first volume (#ThumosBook1), which is the book, THUMOS: Adulthood, Love & Collaboration, now available in hardcover here at Barnes & Noble. This volume is also referred to as “the first book of thumos”. All the terms defined therein make up an effective nomenclature for trading perspectives with social precision at the highest possible level, never before available. This nomenclature is casually referred to as the Thumos language. Its power can be demonstrated by the text string, fb.com/thumoslove, which is the shortest expression of love but with the highest level of seriousness towards the target of your love. THUMOS is about the pursuit of prosperity for all, through guidance towards maximum self-awareness and the adoption of a minimum common background for members of every society. By reading this book, you are taking the first step towards greater personal prosperity. By sharing this book, you nudge others towards theirs. That is how you could uplift humanity, one person at a time. Prosperity rarely occurs naturally; it begins with conscious living. With the goal of bringing you greater prosperity, this book provides you with a framework to achieve maximum self-awareness as well as the tools and instruction to guide you towards pursuing what you truly seek. Your prosperity relies on productivity, your productivity relies on collaboration, and collaboration requires the ability to get on the same page and resolve conflict. The more quickly you can come to a resolution, the more quickly you can prosper. A consequence of pursuing personal prosperity is that we all too often acknowledge it as a lonely one, and fail to appreciate the role others, even seemingly conflicting strangers whether near or far, can have in the pursuit. In our increasingly interconnected world, a book with the goal of changing your life and bringing you prosperity would also have to do the same for everyone; you are just one of the billions of “you”s on this planet who make up, us. With this reality in mind, this book attempts to unite humanity through the establishment of a minimum common background for all so that we may achieve prosperity together in peace. It will explain meaningful and consequential concepts, like Love and Adulthood, in a dialect that is concise and practical, to provide a method of effective and universal communication. From the last chapter, “Legacy is what you do that impacts later generations.” With the potential to have the biggest positive impact on future generations using the least number of words, the ten chapters within this book might turn out to be the finest legacy of the 21st century. In that case, the word that changes the world would be THUMOS. One of the newest members of our humanity is a young man in the middle of his teenage years. For the protection of his privacy, let’s refer to him as David. As soon as David heard of the following story, on the 10th of August 2017, from one of the two authors, he immediately expressed the desire to read the book THUMOS at the earliest time possible. He and his peers around the globe as well as their future generations are the reason why THUMOS was written in the first place. For David, the story began with the question, do you know what onboarding means? It is the mechanism through which new members of an organization acquire the necessary knowledge, skills, and behaviors to become effective organizational insiders. When you first go to work at a large company, you will be subjected to this orientation during the first few weeks as you get used to new processes and the people there. As many aspects of our world are more and more connected, humanity as a whole works kind of like a single organization. What do you think should be its onboarding process? The answer is in the book THUMOS. “Whoa!” Said David in astonishment. The storyteller went on. During the snowstorm of January 2015, a neighbor and me got to know one another as we built an igloo in the backyard. Weeks later he introduced me to his childhood friend who became my co-writer. To be honest, we were not confident of our original material during the first year of our writing project. In January 2016, a PhD graduate from Oxford came to teach at Brown. He ran into us and got to know our book material. The more we fed him with our additional writing in the following months, the more he visibly improved his life. As he embraced our work and gave us constructive feedback, we gained more confidence. The two co-writers no longer wondered why two random guys in Rhode Island like them would be capable of, but, instead, conjured up more and more courage in taking on the responsibility for, setting a new course for humanity. David listened on and, to the storyteller’s surprise, he did not give his smartphone even half a glance throughout the entire conversation. We published the first edition in February 2017 but, other than family and friends, people did not know about it as we were not yet ready for marketing. Few months later, a 2016 Cornell University graduate took a good look at it and decided to write his first book using his power of clarity to make THUMOS more accessible to the reading public, especially the youngest members of our humanity. “Would you like to see a demonstration of some material in the book?” Asked the storyteller. “Do you see me walking?” Asked the storyteller as he stomped his feet at the same place. “I see,” said David in surprise. One of the most-advanced nations on Earth is Belgium. What is the point of advancement in civilization while 70% of is marriages, on the average, fall apart? In a related matter, have your parents ever set you down and explained to you all the elements of the action, love, so that you know how to carry them out appropriately for your target of love? As David rushed back home after exchanging contact information, he couldn’t wait to read the latest edition of THUMOS. Who came up with the following cover design? Who came up with this cover design? Nick came up with the following cover design after taking into consideration the customer value proposition for THUMOS.